Here’s a turning point for Dylan. He had been in a tailspin (often a flaming tailspin) since the late 1970s. His (in)ability to cope with his celebrity status was a big part of the problem, and over time he simply wasn’t usually engaged in the recording process. Dylan would veto efforts by producers to clean up his albums, and he would veto the inclusion of some of the better songs (borne out by the Bootleg Series and Biograph sets). He also would not rehearse sufficiently with his bands prior to recording, and would refuse to do further takes to get a song right. Worst of all, he just tended to coast by while putting in a half effort, at best. This was all compounded by him allegedly being an alcoholic. But a lot of this changed when MTV approached him to do an “unplugged” concert series and album. For the first time in decades, maybe even ever, he was willing to listen to what the studio execs wanted. They wanted Bob Dylan’s greatest hits live. Bob proves somewhat disinterested in these performances, but in listening to the executives he sort of grew up in a way. He was, to put it bluntly, selling out. But in selling out he was also accepting a more viable way of managing his career. In a word, it was professionalism — making him out to be something more like a hard-working entertainer doing what was expected of him by others than a sensitive “artiste” holding out that his place and legacy in society wasn’t fully crystallized. He was ready to give his fans what they wanted, mostly because he was paying attention to the business side of his affairs and seemed to want the steady stream of income that some concessions would provide. But this was also his recognition that he didn’t have complete latitude and needed to take into account circumstances beyond his control. 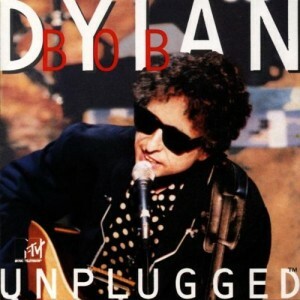 So consider MTV Unplugged like Dylan clearing his throat, preparing to launch into the last part of his career with some sort of enthusiasm. Once he accepted his status as a “rock legend” from an earlier era he could work within that context for his next album Time Out of Mind, spinning tales of jaded regret, bemused nostalgia and weary longing that only work from that perspective of aged credibility (the classic mid-life crisis resolution). Freed from the burdens of having to sound “new” and “contemporary” he could just pick out bits and pieces from familiar terrain and put them together in a way that sounded convincing not contrived.